The Manier Salon in Budapest welcomes foreign students studying in Hungary and would like to contribute to them feeling at home here by inviting them to visit our workshop and showroom, both located in the heart of Budapest, next to the opera. The Manier brand was originated in 1993 by fashion designer Anikó Németh with the guiding principle of creating “unique clothing for unique people.” In her workshop in Dalszinház utca she creates designer streetwear, luxury prêt-à-porter, and haute couture clothing, costumes, and performance wear, all characterized by her “elegant punk style” and the high quality of the fabrics and of the workmanship. The complete line is on display in the Manier Showroom in Hajós utca, located steps from the workshop. Guests from all over the world who seek adventure and playfulness can relive their roleplaying dreams and show off their ageless spirit by ordering clothing designed especially for them, as well as borrow special creations. 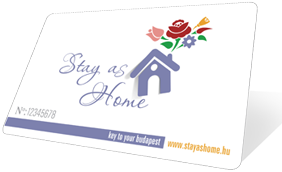 Anikó Németh welcomes all Stay as Home cardholders at her seasonal fashion shows and other events, about which they will receive notice through the Stay as Home newsletter.